The Oracle BI EE 11g Launch Event announced to the whole wide world the latest and most substantial BI release that Oracle has done, and indeed the most important BI release the industry has seen. Now that software is available for download. If you go to the BI downloads page on OTN (Oracle Technology Network), you will find two links - one for 11g and the other for 10g. Click the 11g link, which takes you to the download page for 11g. You have to accept the "OTN License Agreement" before you can download the software. You can download the software for Windows x86 for 32 and 64-bit platforms, and for Linux x86, also in 32 and 64-bit platforms. There are four files to be downloaded, in all a little more than 4GB. 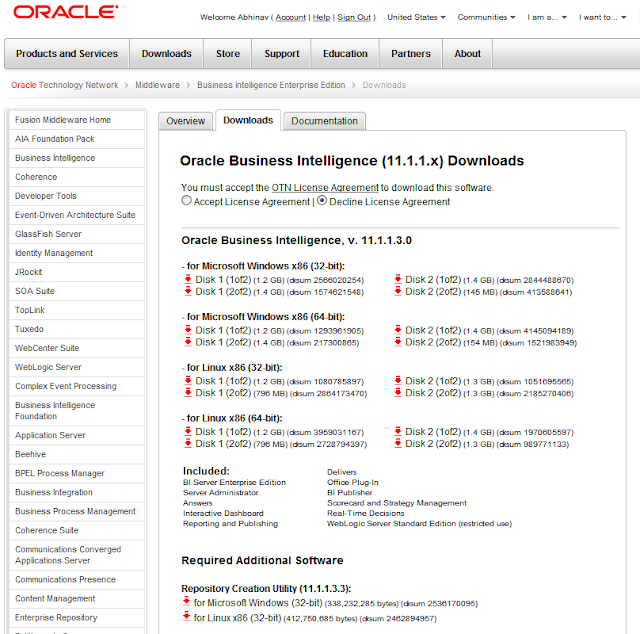 Happy downloading and welcome to Oracle BI EE 11g.